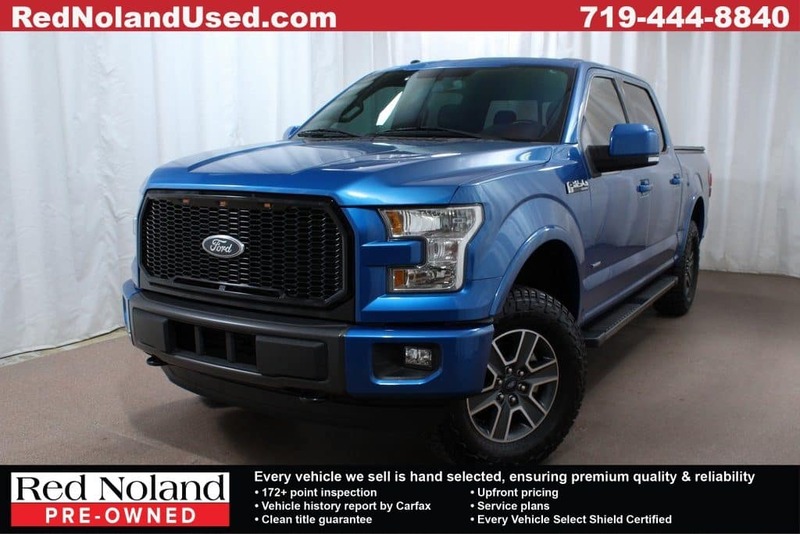 If you are looking for a rugged and capable pickup truck, this 2015 Ford F-150 Lariat is a super option. It is well-equipped with a variety of features that make this F-150 a perfect vehicle for the unpredictable Colorado Springs weather! It is also ready to take on the challenges of a trip through the rough terrain sometimes found in the Colorado mountains. The powerful EcoBoost 3.5L V6 Twin Turbo engine is paired to a 6-speed automatic transmission. The combination provides power and performance you can depend on, plus an impressive estimated 17 mpg city and 23 mpg highway. This F-150 has off-road tuned shocks, FX4 Off-Road Package, and Lariat Sport Appearance Package. Go longer between trips to the fuel pump thanks to the extended range 36-gallon fuel tank. Other great features include voice-activated navigation, twin-panel sunroof, BLIS Blind Spot Information System, Remote Start System, Reverse Sensing System, rear step bumper, and SYNC with MyFord Touch. With this innovative Ford you don’t have to sacrifice comfort and technology to get rugged, capable performance. Stop into Red Noland Used in Colorado Springs to see this Ford F-150 Lariat today. It is just one of the many gently pre-owned vehicles currently available at our dealership. We would like to show you the impressive selection so you can choose the perfect car, truck, or SUV for you!